SB3 Fairy Pouring 23 in. F949 Fairy (large) 15x9 in. 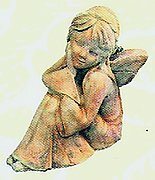 F942 Leaning Fairy 7.5x6 in. F946 Girl Sprite 4x4 in. F945 Sleeping Fairy on Leaf 12x4 in. F941 Closed-winged Fairy 8x5 in. F940 Open-winged Fairy 8x5 in. F943 Elf on Mushroom 10x7 in. F947 Boy Sprite 4x4 in. F944 Little Sprite 4x4 in. F951 Spring Fairy (lrg) 21x13.5 in. F950 Midsummer Fairy (lrg) 21x13.5 in. F952 Autumn Fairy (lrg) 21x13.5 in. F953 Winter Fairy (lrg) 21x13.5 in. M005 Mushrooms 10 x 10 in. Y143 Concrete Mushroom 7.5 x 6in. F916 Fairy with Butterfly 16x12 in. F917 Fairy with Toadstool 16x12 in. F920 Fairy Dancing Oval 12x8 in. F921 Fairy Resting Oval 12x8 in. F930 Fiary with Butterfly frame14.5x10 in. F931 Fairy Standing 14.5x10 in. F932 Fiary Dancing frame 14.5x10 in. F933 Fairy Resting frame 14.5x10 in. F960 Girl Pixie 5x3.5 in. 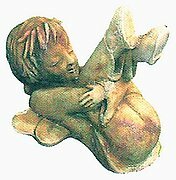 F961 Boy Pixie 5x3.5 in. F962 Girl Pixie 5x3.5 in. F963 Boy Pixie 5x3.5 in. P630 Whispering Putties 11x16 in. P633 Musical Putties 9x17 in. P641 Angel Urn Collage 11x12 in. Z100 Fairy Table Leg (right) 23x12 in. 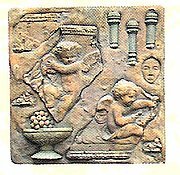 Z110 Fairy Wall Art 17x9 in.